We've had these outdoor chairs since 2007 and they were getting quite wobbly and faded. Mr. H wanted to throw them out and get new ones but of course I said "No way! We can paint them!" So we tightened up all the screws and painted them a light blue color and they were as good as new! The problem was that the maroon seat cushions that came with them didn't match the new color. I went to several stores looking for outdoor seat cushions but since it's so far into summer all of the stores were sold out. That's when I decided I could try to make my own! Now let me tell you, I am not a seamstress. I am far from it but my mom did show me how to use a sewing machine when I was about 12 and I took a quarter (not even a semester!) 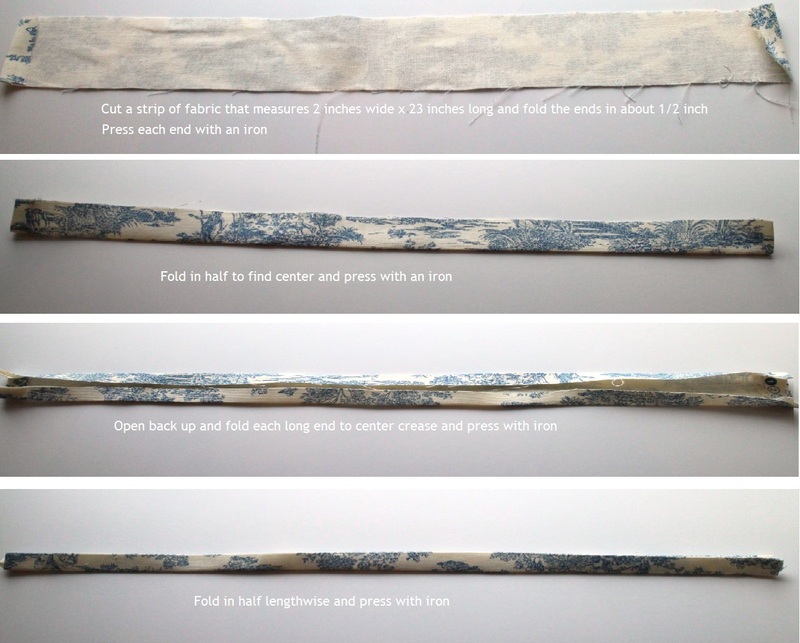 of Home Economics in junior high so I can sew a line. I didn't say a straight line, just a line. 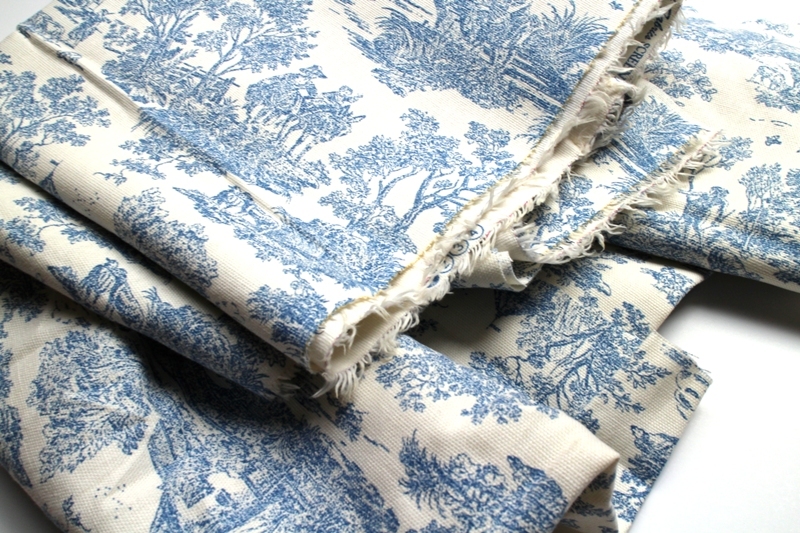 Off I went to Hobby Lobby and found this blue and white toile that I just loved. It was so French! I felt okay about my abilities to make the main part for the cushions; the part I was most intimated by was how to make the ties. 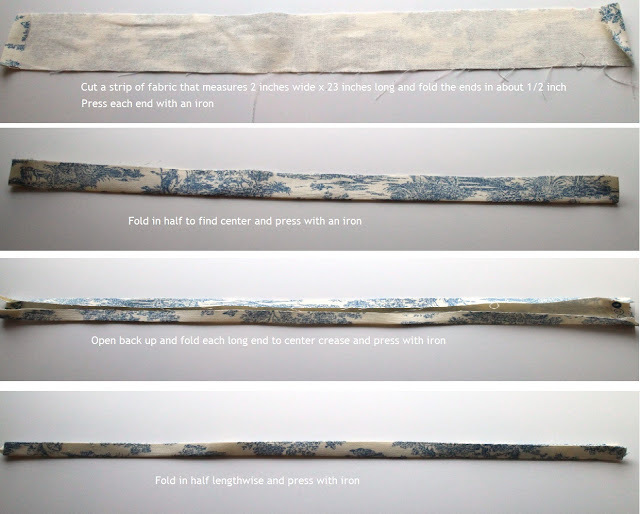 I took apart the ties on the maroon cushions and looked at how it was sewn. It looked doable. All of my blog friends who are experienced seamstresses are probably saying "duh!" to themselves! Here is what I did. (You can click on the picture to enlarge it). It ended up being pretty easy and fun! After the ties were folded, I just sewed them along the edges. For the main part, all I did was face the "good" sides of the fabric together and pretty much sewed a box with an opening on the top to allow enough room to stuff the cushion in. I turned the fabric right side out and sewed the ties on each end, stuffed the cushion back in and did a simple top stitching to close the opening. I didn't even consider trying to put a zipper in (way beyond my level). I did consider Velcro but the maroon cushions were top stitched so I decided that would work for my new cushions as well. Très chic, Khammany! 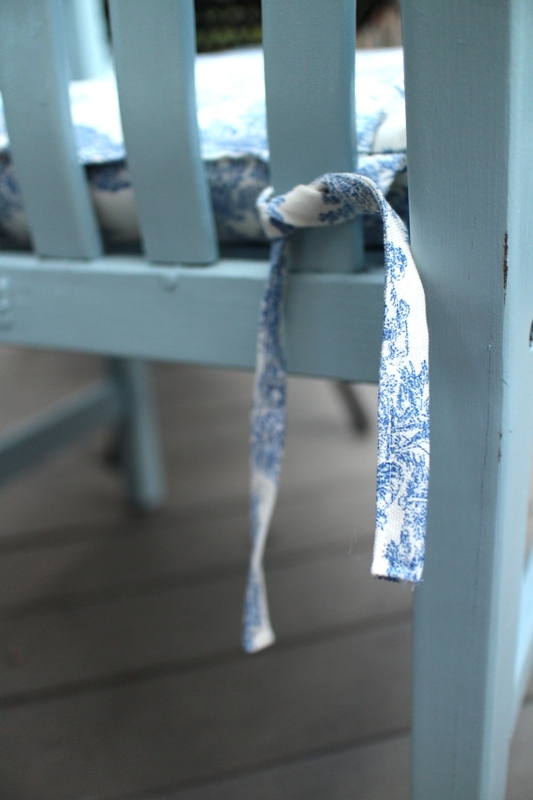 Love the blue and white toile on the chair colour; you sew a fine line! Enjoy! Well done Khammany, love the chairs, toile and the overall look is gorgeous. Really pretty! And that glass of wine is calling my name. The toile looks perfect on those newly painted chairs!!! I also recovered our first breakfast chairs in toile, love it so much! They look great! You did an awesome job! Those chairs got a fabulous makeover!! I love your new cushions - you did a great job. One of my favorite things in life is sitting outside with a glass of wine. Wish you lived closer!! So pretty! I love toile!!! Great choice! I'm in love! I have a soft spot for toile and the cushions look very nice. I need to redo one and I can't seem to be brave enough to work on it! your chairs look fantastic, congrats on the makeover, I am impressed. thanks for coming by my blog and following- so glad I found your blog! Hi Karen, I am so glad you stopped by! And thanks so much for your kind comment! Glad you left a comment, I am now visiting your blog, followed on bloglovin and GCF. Great job on the cushions, love the fabric. Thank you for visiting us and following Red Rose Alley. I see that you like to travel like my daughters, and Europe is where their heart is too. I love home decorating, and you have many wonderful ideas. It's so nice to meet new friends. Oh, your Header is beautiful. I love candles! Wow these turned out gorgeous - what a beautiful blue you used for the chairs - and that toile??? That vignette looks so beautiful and inviting - put another wine glass out for me, will ya? I love that fabric and it looks great with the chairs - good choice! Thank you for sharing this on Fluster's Creative Muster. Now that you found our party I hope that you will continue to join us every Tuesday evening.